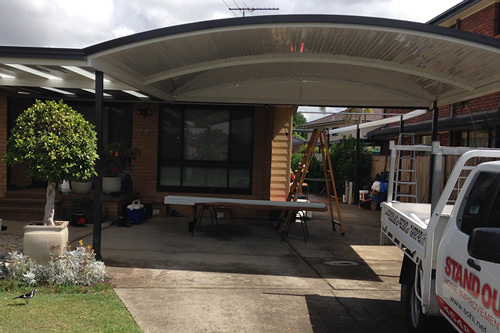 Whether we are building your awning, a carport, privacy screen or a stunning timber deck for your outdoor entertaining area you can be assured we only use quality materials. We choose materials such as Australian Coloubond Steel as it not only maintains its colour for decades but it has been tried and tested against Australia’s harsh environmental conditions. It is these materials and the backing from our suppliers that give us the confidence to use them on your next home improvement project. Using quality timbers to structural steel footings, nuts and bolts, every part of your awning, deck or renovation will be nothing but the very best. Quality materials will give you years of use without the need of nasty or costly repairs and in addition add value to your home. It is a requirement under the Home Building Act 1989 that any construction, alterations or addition to your home is carried out by a licensed builder. This includes carrying out repairs to your home. You will be surprised how quick we get the work done. Through project management we will get your home improvements underway and finished promptly and professionally. As customer we understand you want a quick turnaround from your initial inquiry to the completion of your home addition. Remember when choosing SOHI for your next home improvement project your going to get quality materials supplied and constructed by qualified builders in a prompt and professional time frame.